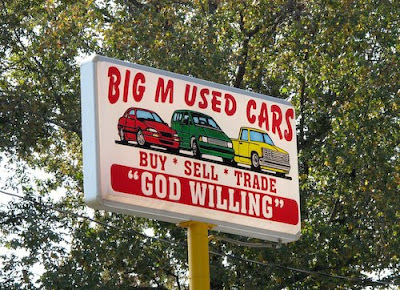 The “Blog” of “Unnecessary” Quotation Marks: used, "God Willing"
Katie writes, "Still haven't figured out which part of 'Buy Sell Trade' -- if any -- that 'God Willing' applies to." Me neither. Ack, give me tranquilizers. I thought the apostrophe wildness was enough to make me pull my hair out. Eek, eek! LOL. We'll buy, sell or trade "God willing" our car doesn't fall apart before you sign on the dotted line! That's a terrible slogan for any company! I think I drive by this every day. and I haven't noticed the bottom of the sign.